"Are you having a laugh? Is he having a laugh?" No shock, but Ricky Gervais avoids the sophomore slump in this, the second season of his second series�things have changed considerably for Andy Millman, the film extra with big dreams we meet in the show's first season, but the gimlet eye of Gervais and his partner in crime, Stephen Merchant, make this another very funny set of six episodes with Andy and his increasingly famous friends. Fans of the show may recall that when last we left our hero, his sitcom pilot got greenlit at the BBC, and we pick up with him as he sells his soul piecemeal, trading in his ideas of cutting a wide swath for making nice with development executives and listening to and taking their notes. What Andy ends up with is a series called When the Whistle Blows, in which he plays the sniggering boss in a stupid wig and big glasses, and the stock in trade of which is leering double entendres and desperate celebrity cameos designed only to pander to the ratings gods. No doubt deliberately, the show within the show plays out like what The Office might have been if it was patched together with focus groups and market research, rather than Gervais' and Merchant's comic intelligence. As these six episodes progress, you can see Andy getting puffed up with being on the telly, and then continually getting deflated�it's like he's coming to the searing realization that he's not really Robert De Niro; he's Benny Hill. His pals are back, of course, starting with Maggie (Ashley Jensen), another "supporting artist" who doesn't quite know what to do with her best friend's success; and Merchant as Andy's impossibly incompetent agent, who can be blithely offensive to just about anyone, but can't actually seem to get his one client a job. Each of the episodes features a prominent celebrity playing himself or herself, and having fun with their public personae�when Andy lands a bit part on a Harry Potter movie, Daniel Radcliffe is hilarious as a clueless, horny teenager propositioning Maggie, for instance, and Ian McKellen's aria on what his acting process is like is priceless. (David Bowie's ode to Andy, Chubby Little Loser, perfectly epitomizes Gervais's cutting humor and apparent eagerness for self-deprecation.) The keen ear of the show once again sometimes puts us on this side of the Atlantic at something of a disadvantage, for lots of the industry humor is about BBC regulars and British pop culture that hasn't been exported�if all the Ronnie Corbett jokes are working for you, you're one up on me. But you won't be at sea for most of it; particularly inspired is a riff on Pretty Woman, with Maggie and Andy shopping for a dress at a snotty little shop. As Andy rises up the entertainment food chain, you can almost feel the show getting a little bit unmoored�this season isn't really about extras at all, but about the deluded who produce crappy TV and think that they've got the rapier wit of Oscar Wilde. So almost as if to compensate, the characters have been drawn deliberately stupider. The six episodes are full of pratfalls and dopey visual jokes; Gervais and Merchant are also endlessly inventive in coming up with ways for Andy to mortify himself, and us. They also reward their dedicated viewers with a couple of very funny callbacks from the first season�and given that The Office ran its course after its second season, we may have seen the last of Andy Millman, so savor these, much more than you would the inevitable Very Special Episode of When the Whistle Blows. Image Transfer Review: Generally a nice looking transfer, with occasional discolorations. Audio Transfer Review: All the dialogue is clear; a couple of the accents are a bit thick, and the series favors a v�rit� style, so you may not pick up every nuance the first time through. Extras Review: One caveat: dOc was provided only with a screener copy for review, so I can't comment on the set's final artwork and roster of bonus features, and the technical issues may not be identical for you. 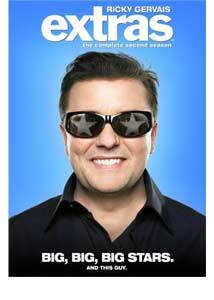 Nonetheless: each of the two discs in the set holds three episodes, and each episode comes with an installment of Extras Backstage, featuring interview footage with Gervais and Merchant, as well as various members of the production team and cast, as well as guest stars. Each disc also holds a reel of outtakes; and the fun continues with Art of Corpsing (13m:39s�on the second disc), about the prevalence of the actors to crack up during takes. Finally, Taping Nigel: The Gimpening (24m:17s) seems like an inside joke that's lost something by being shown to the world and by going on quite so long. Six more caustically funny episodes, principally about being careful what you wish for.